Do you work for A2Z Site Solutions? Global Shop Solutions ERP software provides efficient, speedy transactions with our eCommerce application. 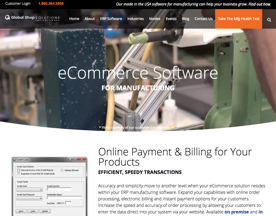 Expand your manufacturing capabilities by adding eCommerce to your other ERP applications including shop floor, CRM, inventory, job costing, scheduling, shipping, and more.